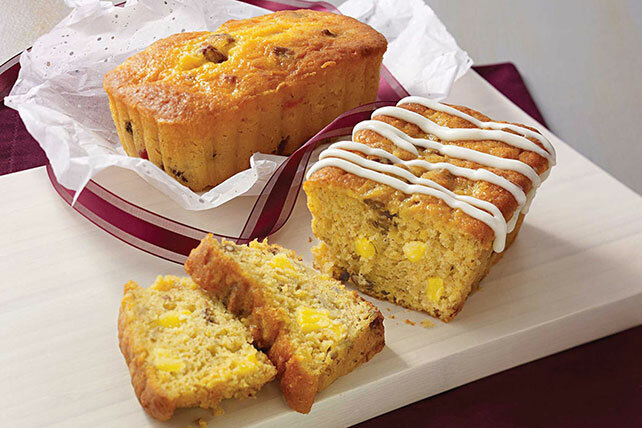 This classic Southern recipe made with pineapples, bananas and pecans is delicious any time. The cream cheese frosting is literally the icing on the cake. Drain pineapple, reserving 1 cup juice. Add reserved juice to dry cake mix, dry pudding mix, cinnamon, eggs and oil in large bowl; beat with mixer until blended. Add crushed pineapple, bananas and nuts; beat just until blended. Pour into 5 mini foil loaf pans sprayed with cooking spray. Bake 40 min. or until toothpick inserted in centers comes out clean. Cool completely. Beat cream cheese, milk and sugar in small bowl with mixer until blended; drizzle over loaves. While I normally attach a recipe to one of my heroines or heroes, today I’m going to mention Katherine Barron Tate. Katherine is a mama bear when it comes to her boys but she is also a Good Southern Woman, right down to her strand of pearls. Y’all will understand all about that come the release of THE COWBOY’S CHRISTMAS PROPOSITION. It releases on October 1st and you can pre-order it HERE, or if you don’t want to wait, you can grab it now from the Harlequin SITE. This entry was posted in Writing Life and tagged books, characters, food, fun stuff, recipe, Tuesday Treats. Bookmark the permalink.